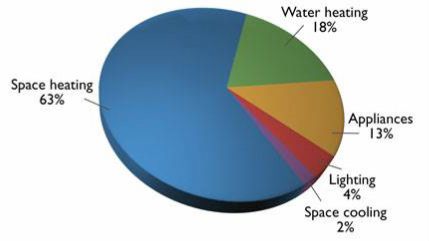 Source: Natural Resources Canada Report to Parliament 2008. There are many answers to the question why build green. Quite often, when buying a new home or building a warehouse, operating costs are not top of mind. Making sure our homes and buildings use energy efficiently is just plain smart. Using resources more efficiently means using less gas for space heating, less electricity to run lights, fans and motors, and using less water to get stuff just as clean. Using resources more efficiently saves money. A lot of money. A key benefit of an energy efficient home is added comfort. Energy efficient homes have less temperature variation from room to room. They are more airtight, reducing bothersome drafts on windy days. Triple pane windows are more energy efficient and block outside noise. Well ventilated spaces get rid of odors and prevent health hazards related to mold. Reducing green house gas emissions (GHGs) from homes and buildings reduces pollution all around us. Lower GHGs means our neighbourhoods and cities are a cleaner, healthier environment for our families and co-workers. Builders who take steps to minimize construction waste reduce your home's impact on landfills and incineration. Green buildings use natural products that are less harmful and improve indoor air quality. Some finishes can continue to release unwanted VOC’s (Volatile Organic Compounds) years after their initial installation. Not using these products in the first place is always a better solution. Ceramic tiles that have been baked in super-heated ovens carry a heavy energy cost. Polyvinyl chloride (PVC), a commonly used floor finish, contains a variety of chemicals from non-renewable sources. Using natural stones like slate, specially if they are quarried nearby, provide a rich look without the heavy environmental burden. New homes, commercial buildings and condos built today will last for at least 100 years. All property owners want to make sure their building ages well and retains its value. It is not rare to see buildings in Europe and Asia that have 800 year old roofs, typically finished with thick clay or slate tiles. While renovating are expected, most building components should be selected for their durability. Cheap today is not necessarily cheap if the item won't last. Polished concrete floors may prove significantly less expensive than carpets that have to be replaced every seven to ten years. Green construction extends to the relationship between a building and the land around it. Fully integrated storm water management and rainwater harvesting can be used to keep landscapes lush and green. Living walls and green roofs can blur the difference between building and landscaping. The judicious use of native species and bio-swales can support wildlife and greatly improve the curb appeal of a property. At some point in the future, everyone will want to resell their home or business. A building that requires little or no renovation will retain more of its original value. An astute owner will use a building's track record of low energy consumption as a selling point with prospective buyers. There are also many jurisdictions in Canada where an energy assessment is necessary before a home is sold. The built environment has a vast impact on the natural environment, human health, and the economy. By adopting green building strategies, we can maximize both economic and environmental performance. Green products and specifications need to be integrated into buildings at the outset, during the initial design. Green methods need to be used during construction, renovation and deconstruction. If protecting the environment and improving biodiversity are not good enough for you, think about the money being spent cleaning up the mess left by past practices. Decontamination of old industrial sites. There's not enough time and money to do things right, but somehow we always seem to find the time and money to do it again, to go back and fix shortsighted decisions of the past. Building performance: a Post-Occupancy Evaluation of 12 GSA Buildings. Building green has many economic benefits, from reducing operating costs to expanding the local market for green products and services. Optimizing life-cycle performance is a decision that can be driven by the bottom line. Building in a way that minimizes or eliminates reliance on municipal infrastructure benefits all of us through lower utility charges and lower property taxes. For example wide use of rain water harvesting in a neighbourhood could eliminate the need to expand municipal storm water infrastructure thus reducing everyone's tax burden. Reduced exposure to mold, mildew, and indoor toxins lowers our collective health costs. 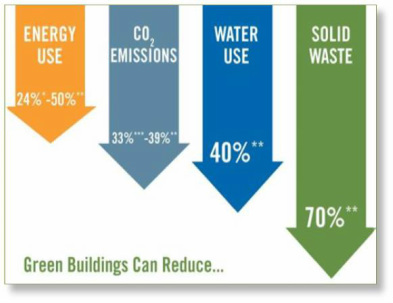 A 2008 study states that green homes can have 50% cleaner air, a 30-70% reduction in energy bills, and a 50% decrease in the amount of waste sent to landfills during construction in comparison to conventional homes (see chart). If wise decisions are made, there should be no significant difference in the average cost of a green building in comparison to a conventional building. One source states that upfront costs of a green building can be as much as 2% higher than for a non-green building, however over time, operating costs can be lower by 20%. LEED certified buildings use on average 32% less electricity, 26% less natural gas, and cause 36% less CO2 emissions than conventional non-green buildings. Green construction produces 70% less solid waste which otherwise would have gone to a landfill. The US Department of Energy states that today’s buildings consume more energy than any other area of the economy, including transportation and industry! The EPA states that Americans spend more than 90% of their day indoors where the air quality can be 2-5 times more polluted than the air outside. According to the EPA, $60 billion of annual productivity is lost because building related illnesses. Traditional paints release low level toxins into the air that can continue to pollute the air for years after application and cause adverse health effects. Eco-friendly paints offer the benefit of better gloss retention, better surface resistance, less pollution, and low odor.